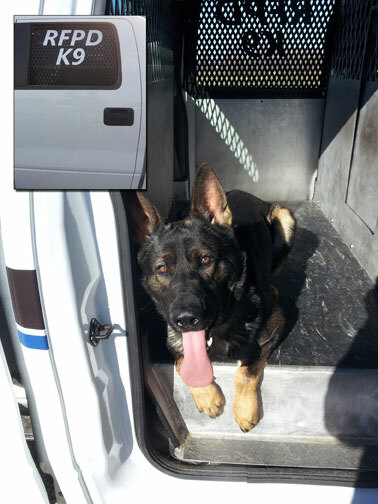 Rock Falls, IL, January 22, 2013 – When the Rock Falls, IL, police department was looking for a new vehicle for its mobile K9 unit, it decided that something other than the usual kennel was needed to go with the new super crew cab pickup it had decided to use instead of an SUV. Because there was no real need for the K9 officer to transport prisoners, the department wanted to have a special mobile kennel built that that would occupy the entire rear seating area of its new Ford F-150 pickup. This would allow plenty of room for the dog and also enable him to jump in and not have to immediately turn his body to the rear of the vehicle as he had to do in the one-third/two-third kennel design that was used previously, saving wear and tear on the joints in the dog’s hips, shoulders and legs over the numerous times he gets in and out of the vehicle throughout a typical shift. After researching kennels from several manufacturers, the department decided a custom solution was needed and turned to The IFH Group, an area metal fabricator that is also a major supplier of hydraulic oil reservoirs and fuel tanks for off-road vehicles. With its extensive metal fabricating expertise and state-of-the-art equipment, The IFH Group designed and built a mobile kennel that not only met the requirements of the department, but improved upon them as well. In addition to occupying the entire rear seating area of the crew cab, the new kennel provides plenty of ventilation between the front cab area and the interior of the kennel to more easily control the climate for the dog’s comfort and safety. Fabricated from aluminum using laser cutting, bending, welding, and powder coating, it can be easily cleaned with a garden hose without water going all over the inside of the vehicle. It has a sliding door so that the dog can get from the kennel area to the front of the vehicle in the event of an emergency or to deploy him from the front on a fleeing suspect. In addition, The IFH Group provided custom window screens with “RFPD K9” laser cut and welded into them as well as the dog’s name, “Nero”, laser cut and riveted to the sliding door inside the cab – all without any permanent modifications being made to the vehicle.